Creative coding through the arts. Play, Code, Share enables primary and secondary schools to explore a new creative model of delivering computer programming by working with experts in the field (digital artist Ashley Brown and robotics expert Dr Claire Rocks) and students from the Computer Science Department of the University of Warwick. This project, running from Autumn 2015 to Summer 2017, has worked with President Kennedy School, Barr’s Hill School and Parkgate Primary School in Coventry. 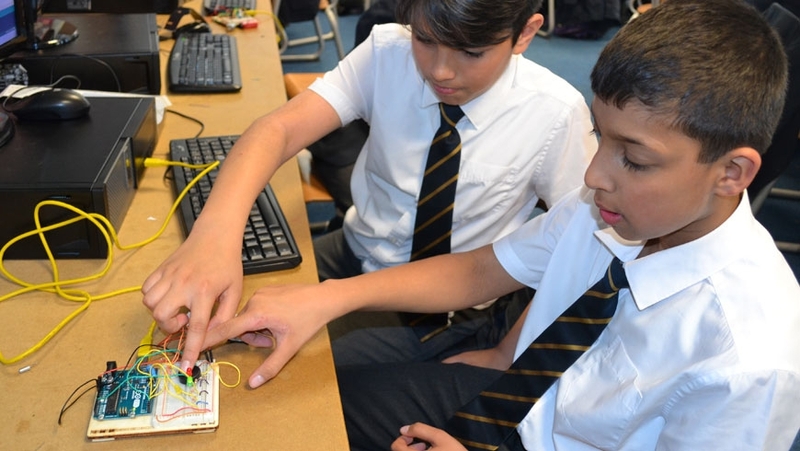 Play, Code, Share will extend the experience and understanding of pupils and teachers by making direct links to the latest digital technologies, their creative application and knowledge gathered at the University of Warwick and Warwick Arts Centre. …PLAY. Be challenged, experiment and take risks in learning and teaching. …SHARE. The outcomes and models of practice will be shared locally, regionally and nationally by the children and teachers alike. The Project culminated in Digifest 2017, held over two days in June at Warwick Arts Centre, which saw the young people presenting their work to each other, live gaming in the Cinema, a showreel of International digital artists’ work and a series of workshops by local digital artists. Read our blog about the day here. This project is currently in its next stage of development, with the view to secure further funding. For more information, contact ed.artscentre@warwick.ac.uk.